In the collaboration with European Medicine Agency (EMA), the European Centre for Disease Prevention and Control (ECDC) on the topic Antimicrobial Resistance (AMR), ESNO participated in the development of a ECDC-funded survey to assess Healthcare Workers knowledge and attitudes about antibiotics and antibiotic resistance. Our involvement was the Specialist Nurses view. The aim is to have an overall return of 10,000+ responses across the EU and EEA member. The Survey will be published in January 2019. The overall objective of the study for ECDC is to fill in gaps in terms of evaluation of communication campaigns targeting healthcare workers and to gain a better understanding of their knowledge and perceptions to provide a base to support future needs in terms of policy and education changes. 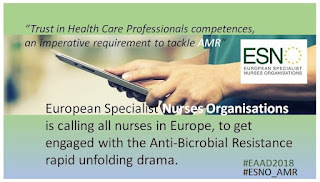 As ESNO representing European Specialist Nurses with the ECDC, we are especially interested to learn from Specialist Nurses where the current gaps are and based on outcome initiate education activities in Europe for Specialist Nurses. Once you receive the link to the survey in January, we would very much appreciate if you could disseminate it throughout your nurses network and organisations. Your time, willingness and interest would be of great value to us.